Saturday, August 13, 2011 Scranton’s top bjj practitioners Jeff Reese and Tyler Calvey entered the New England States Championship Tournament hosted by Jim Hughes and Royce Gracie. This tournament was first conceived of by Jim Hughes, a Royce Gracie Black Belt. A throwback to the glory days of competition the rules were simple; NO weight classes, NO time limits, NO points, ONLY win by submission! This tournament format is where true, pure jiu jitsu shines: outlast, out-technique, and out-strategize your opponent. The winner of this tournament would be the guy that was truly the best jiu jitsu practioner and not the best points player. Round two saw the field of 16 paired up. Jeff and Tyler both submitted their opponents in rapid fashion. Jeff winning with a cross side key lock and Tyler with a trianle from guard. 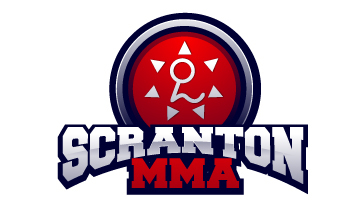 Both Scranton bjj competitors were afforded a brief rest while the rest of the competitors narrowed the field to 8. Round three saw the 8 remaining competitors paired up. Tyler and Jeff made quick work of their respective opponents. Tyler scored a quick double leg takedown and quickly finished of his opponet with a straight arm lock. Jeff scored a takedown with a hard ouchi gari and ended his match with a cross choke from side. “That was a good takedown,” stated Jeff when asked about the match, “he stepped in just as I intiated the ouchi. I was intending to end the match with the throw, you know, knock him out, but he was tough.” Again having made quick work of their opponents the duo was privy to a short rest while the field of competitors became 4. Round four on the other side of the brackets saw Jeff paired against tournament favored Dan Simmler of Worcester MMA. Dan, a Renzo Gracie black belt, student of 4x judo Olympian Jimmy Pedro, and undefeated middleweight mma fighter had made quick work of each of his opponents in the prior rounds. Undaunted Jeff approached the match like every other match; outlast, outwit, and win. The match started with both competitors trading takedown attempts that were countered by the other, eventually seeing Dan pull guard and begin to work. Jeff worked feverishly to pass but couldn’t solve the riddle, after countering a few submission attempts Jeff backed out to standing. Again both competitors found a stalemate on the feet and this time Jeff decided to pull guard and try his luck on the ground. Dan pressed Jeff’s guard hard countering each sweep and submission attempt until he finally pumched a hole in Jeff’s defense and began to pass. Jeff saw the danger of having such a skilled opponent achieve cross side and quickly scrambled to turtle and back to his feet. The crowd cheered and Simmler shot a quick single forcing Jeff down. Jeff hit the ground, rolled to turtle and bounced back to his feet. Jeff gripped Dan and shot a quick fall away arm lock that Dan countered smoothly, again forcing Jeff to scramble to turtle and back to his feet. Immediately Jeff gripped and shot a second fall away arm lock. Dan countered again and a sramble intiated finding the competitors locked in a pitched 50/50 guard battle. Neither competitor could gain the upper hand in 50/50 and so broke away to standing. Dan pulled a quick guard, transitioned to dela riva and swept Jeff. Yet another scramble ensued but this time the more seasoned black belt competitor caught a grip on Jeff’s collar. Simmler transitioned to the back, stepped over, and executed a beautiful loop choke forcing Jeff to tap at 13:40!